The Kenda Klever S/T utilizes an asymmetrical tread design and advanced engineering to supply confident all-season performance for vehicles requiring speed-rated technology. 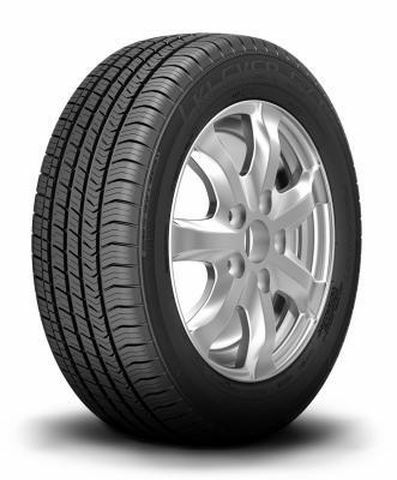 The Klever S/T is designed to provide a long tread life, maximize ride comfort and a balanced tire performance for snow/wet weather for a wide range of CUVs and SUVs. 225/60R-17 600AA 1,709 lbs 44 psi 11/32nds 7" 9" N/A 28"
Purchase includes the Kenda Klever S/T KR52 tire only. The wheel rim shown in the picture is not included. Picture provided is a stock picture from the manufacturer and may or may not reflect the actual product being ordered. All Kenda Klever S/T KR52 tires are continuously developing with manufactured improvements. With that said, Simple Tire and the manufacturers have the right to change these tire specifications at any time without notice or obligation. Please Note: Specifications of the Kenda Klever S/T KR52 tires shown above are listed to be as accurate as possible based on the information provided to us by Kenda tires. This product is covered by a 60,000 mile manufacturer’s treadlife warranty. After about 5,000 miles on my new Kenda's I must say I am impressed. When the tires are cold, yes there is a little vibration but once they roll out they're great. Very smooth ride on these, I noticed that right away. I've driven in very, very heavy rains twice and they stuck to the road quite well and I did not notice any hydroplaning at 55+ miles an hour. Very quiet too. As quiet as my Bridgestone that I replaced. The only question mark for now is how long will these last. Wear seems to be good but way too early to tell. I would, at this point, buy these again. So far these are comparable to Bridgestones....and for the money, these are now my "go to" tire. I was looking for tires for my daughters car via the brick and mortar method and they were expensive. Thinking I would have to settle for a less then tire this process started making me feel frustrated. Then I came across the simple tire website and found the best price on the exact tires I needed. I did not realize I can order tire and then shop any garage that performs alignments and mounting to get the best service and price since I was able to control the price of the tire. Great job and when my Tundra is ready for new tires I am buying them at Simpletire.com My baby girl loves the new tires she is now driving and new tires and we were able to save money in the process Thank you. By submitting a review, each person received a sweepstakes entry. All around great tire!!! When the time finally comes that I need new ones, i will not hesitate to order another set of the exact same ones. By submitting a review, each person received a sweepstakes entry.